2005 - Planet of the APs: are corporations and other artificial persons taking over the legal system? Keynote speaker Marc Galanter, professor of law and South Asian Studies at the University of Wisconsin, Madison. Are corporations and other artificial persons taking over the legal system? A provocative assessment of the power of “artificial persons” in the court system formed the centerpiece of the 55th annual Mitchell Lecture featuring keynote speech by Marc Galanter. “Planet of the APs: are corporations and other artificial persons taking over the legal system?” was the title of the event, which featured a keynote speech by Marc Galanter, professor of law and South Asian studies at the University of Wisconsin, Madison. 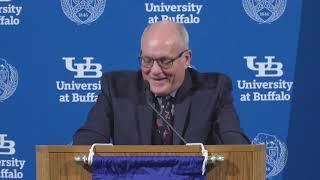 Galanter, who taught at SUN Y Buffalo Law School from 1971 to 1977, addressed the growing power of artificial persons – APs – and spoke of the relative disadvantage that individuals face because of that trend. APs, Galanter said, are changing the character of the legal and judicial world – partly because of a dramatic transformation in how social life is conducted. For example, he said, the family-owned grocery store has been replaced by the supermarket, which itself is now being challenged by national chain retailers. “An increasing portion of all our encounters and transactions and relationships are with APs,” he said, and case law has grown to reflect the increasing prominence of these legal actors. Citing figures, Galanter said that in 1970 about 40 percent of civil cases in federal courts involved a natural person suing an artificial person – an individual suing a corporation, for example. Now, he said, that figure is 60 percent. “Increasingly, the legal system is occupied by individuals trying to control the behavior of artificial persons,” he said. And that, Galanter said, works against equal access and effectiveness in the courts for individual plaintiffs. “The courts,” he said, “are like referees in a basketball game between a natural persons team of 6-foot-tall players and an artificial persons team of equally talented 7-foot-tall players. The 7-foot team does not get its baskets dishonestly, and sometimes the 6-foot team even wins. But over the long haul, the disparity of resources is reflected in the scores.” Even the way courts decide most cases has been influenced by the shaping hand of artificial persons, Galanter said. As APs move to consolidate their power and are increasingly motivated by concerns about their own power and reputation – rather than their origins as suppliers of goods and services – the practice of adjudication is being transformed. “Courts are shifting from a dispute settlement perspective to a more future-oriented, more managerial, more utilitarian, generally more legislative kind of stance,” he said. “Fewer cases go to trial; more are terminated by pretrial adjudication.” Galanter qualified his assertions by saying, “I do not mean to portray the legal system as one in which individuals never prevail. What I am trying to describe is a structural and cultural situation that puts them at a relative disadvantage, one that is increasing over time. The 7- footers are growing into 8-footers.” Following Galanter’s address, three panelists in varied fields responded out of their own expertise, raising questions and further points. First up was Gerald Berk, associate professor and head of the department of political science at the University of Oregon. As a historian of political science, his impulse was to look back and ask, “What have others who have been concerned about corporate or organizational power done in the past?” Berk noted that, earlier in U.S. history, social and political reformers also advocated the concept of the artificial person, saying among other things that powerful APs are a useful check on government power. The next respondent was Meir Dan- Cohen, professor of legal ethics at the University of California at Berkeley School of Law. Discussing some of the theory behind Galanter’s ideas, Dan-Cohen asked whether APs’ disproportionate influence on the judicial system is necessarily bad news. He related the discussion to the division between “haves” and “have-nots” in the legal system, and noted that corporations, for example, are not necessarily “haves” in the classical sense. Therefore, their presence as APs could be viewed as a step toward equal justice. Westbrook also said the distinction between APs and natural persons may be too closely drawn. “In an important way,” he said, “there are no natural persons in courts. There are plaintiffs, defendants, lawyers, clients, judges, witnesses and so forth. Entering a court requires that one adopt such a predefined role.” The 2005 Mitchell Lecture committee was chaired by Professor James A. Wooten and included Associate Professor Athena D. Mutua, Professor Robert S. Berger, and Professor Rebecca R. French, who moderated the question-and-answer period that followed the discussion. The annual lecture is funded by a generous endowment from the estate of James McCormick Mitchell, a member of the school’s Class of 1897.